The statement that technology will not replace teachers has been something that resonates with me daily. I think about how technology has changed teaching and the positive outcomes of a global paradigm shift that is occurring in education. Over the past few years there has been much written about technology and education. Below are a few of the articles that have resonated with me. The article asserts that once you mention the word technology, everyone focuses on the shiny new doodad. When, in truth, technology should just be another tool in an educator’s toolbox. In today’s “Information Age”, teachers are no longer the source of all knowledge that is to be doled out at a predetermined rate. Technology has put all of human knowledge into the hands of students and the role of the teacher has evolved to help students become critical thinkers and problem solvers. I have always enjoyed listening to George and Alec Couros speak about how education is changing to meet the demands of the modern world. George’s book, The Innovator’s Mindset, should be a must read for today’s educational leaders. However, it is his quote about technology and the transformation of education that gets me thinking about the evolution of education. Things like the chalkboard, the ball point pen, the overhead projector, the photocopier, and the laptop are all technologies that have changed and shaped education. For me, it isn’t just about the newest tools, it is about how teachers embrace the new technology and transform their practice to help students learn in new ways that were not even imagined prior to the advent of the the technology. On the surface, this quote sounds similar to the previous quote from George Couros. When you take a closer look and read a little deeper, a disquieting message appears. 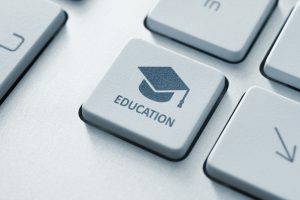 Like George, Hari asserts that technology will not replace teachers; when you read the article you see that he shares similar thoughts about the transformational power of education and technology. When I read George’s quote, I feel inspired by the potential of technology in the classroom. Conversely, Hari’s statement fills me with dread. Hari poignantly illustrates the glacial pace of educational change and the aversion some of my colleagues have about the transformational power of technology in education. Do we really need to wait for the luddites to leave education before they are replaced by educators who see technology as a worthy and transformational part of their pedagogical toolbox? Or, is there a way to encourage all educators to embrace technology, no matter their tenure?